Spoiler: This post contains a full frontal photo of me in a rubber suit with my package clearly visible. At the end of this month, I shall be racing a triathlon for the fist time in a long time. So long has it been, that on Wednesday last week, I thought it prudent to check that my triathlon suit has not drastically shrunk during its time in my drawer. It has. A little. But I was able to squeeze myself in. Just. I hope it returns to its normal size in the next few weeks! It has been even longer (about 3 years?) since I wore my open-water swimming wetsuit. I thought I’d perhaps try that on too. This took longer. It even required a break part way through – to cut my nails for fear of tearing the rubber in my efforts to wrench the obviously aged and stiffened material further on to my muscular, svelte frame. I can’t believe this suit has shrunk as much as it has! After the leg/bum/tum workout that was the application of the lower half, I crouch down and manage to get one arm in, using the ‘slowly standing straight’ method of pulling the remainder of the wetsuit into approximate position. I figure, as long as I don’t need to breathe at all during the swim section of the triathlon, I shall be fine. 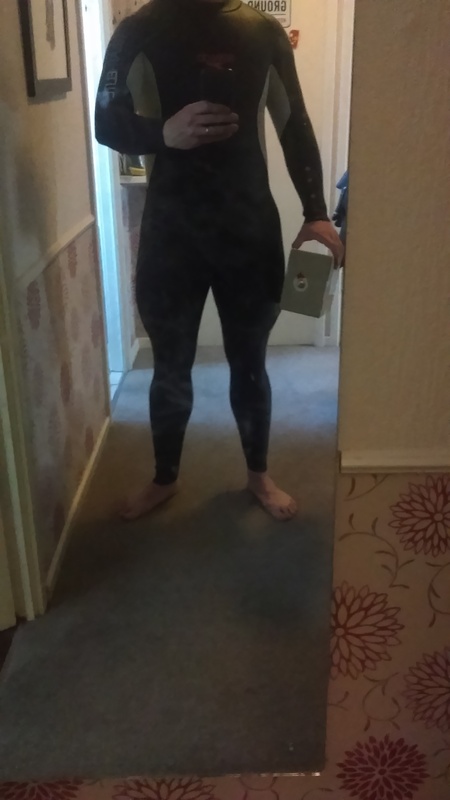 Using a combination of yoga poses, near dislocation, and the sheer determination that only wetsuit wearers possess, I managed to actually put both arms in AND zip the zipper all the way up! An actual ding-dong. A someone-at-the-door ding-dong. A day before son’s birthday, might be a parcel, best not ignore it, sort of ding-dong. I have no choice. I go and answer it. I try in vain to explain exactly why I’m wearing an overly tight-fitting rubber suit on one of the hottest days of the year so far as I collect the package – clearly seen in the photo below (I knew instantly that this would be a blog post – and one that would require a photo with a caption!). I was recently offered some more Chaffree underwear for free – I declined. I have written before about Chaffree underwear. They asked me to. They sent me some free to try. I like them – a lot. If I didn’t, I would say. They work – if they didn’t, I would say. Question – So why did I decline some free ones? Answer – Because they’re worth buying! So I bought them. In the interests of transparency, I have to declare at this point that having bought myself a further two pairs, Amanda, the Chaffree boss-lady, sent me an extra pair anyway. … but if you do… seriously consider giving these a go. I wasn’t asked to write this. I want to. Because I love you. I don’t reallyknow who you are. You could be anybody. I might know you. I might have met you. I might even love you, I suppose. Mum and dad occasionally read this blog. Hi Mum. Hi Dad. I love them. The rest of you… well… You’re lovely too I’m sure… But the point is I did just want to write this as I wouldn’t want any of you to suffer unnecessarily with the pain that comes with chafing, especially when (but not limited to) running. If you’re a blogger/runner/professional-underwear-reviewer then find them on Twitter (@chaffree) and get in touch with Amanda, as I know she’s always on the lookout for bloggers who write betterer than wot I do an’ that. It’s been a little while since I got a 5k PB [ ‘personal best’ that is – for the benefit of my aging parents…and American people 😉 ]. Not since my little PB streak inspired by a new Garmin and a bit of weight loss before Christmas. But a couple of weeks ago, my son’s school hosted their annual 5k charity race and we both got PBs. He broke his by 4 minutes(!) to go sub-30 with 29:20, and I took about 30 seconds of mine to go sub-22 for the first time ever with a 21:45. In case you were wondering… that package in the wetsuit photo…it was some new running shorts that I won through completing a challenge with ‘Running Heroes‘ (if you sign up, use referral code 6w7m for extra points!). It wasn’t a present for my son. I could have hidden and not answered the door and it wouldn’t have mattered. Point of information: we have read every one of your blog posts and have known for quite some time what a PB is. What’s a DNS or a DNF ? Well done on the PB”s. I love that Mum seems to have told you off! Go Mum! One reason I don’t surf is the wetsuit dance, two is the sandy wet suit dance you have to do after lunch three might be that I’m not a great swimmer! Good luck with the triathlons and getting in to the wet suit!